Munich Shooting: There is another terror attack which happened recently. German police are still searching for the culprits who attacked at the Olympia shopping mall in Munich. They killed six people and wounded many. Those who attacked are still out of reach of the police. Witnessed revealed that they were a group of three people with guns. In awe of such events, the police of Germany has urged people to avoid public places as much as they can until the attackers are caught. Shop workers are confined in the mall building which is located in the north-western Moosach district. Moreover, the public transport system has been temporarily suspended. With this attack, police have referred the current situation as “an acute terror case.” According to them, the first reports of a shooting in Hanauer Street came before 16:00 GMT. Given the Munich shooting situation, the central railway station of the capital Bavarian has been evacuated. People are being stranded by the emergency situation. So, they are being offered shelter by locals as they are unable to return to their home. This initiative for the good cause was launched with the Twitter hashtag #Offenetür (open door). 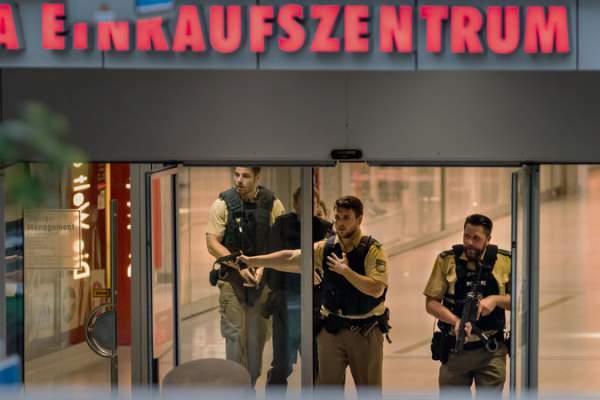 Passengers on Munich metro ordered to evacuate immediately. Police helicopters are continuously on surveillance. To quickly deal with the situation, special forces have been deployed in a huge number. Bavarian public radio reported that an elite border security unit GSG9 has left for Munich with several helicopters. Also, Bavarian PM Horst Seehofer have been reported to have a special meeting with security advisers. To tighten their safety, the neighbor nation Czech Republic has increased its force to minimize the risk. The security forces of Germany have been kept on high alert since a teenage migrant reportedly stabbed and injured five people on a train in Bavaria on Monday. This attack was claimed by ISIS. The authorities are suspicious of such incidents in the future. A man working at a petrol station in Munich told the BBC: “We see just ambulances and it’s like firemen and police but all this area is evacuated, all the streets. Munich police said they did not know where “the perpetrators” were. “Look after yourselves and avoid public places”.